The plumbing experts from Pipe Wrench promote battery backup sump pumps over water powered backup sump pumps! In the case for battery backups, we can install a better & more reliable system with alarm terminal connections that is installed according to manufacturers instructions & plumbing code. 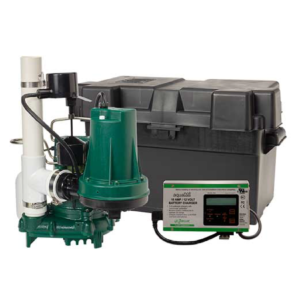 The difficulty with water powered backup sump pumps is that there are important manufacturer installation & Michigan Plumbing Code requirements that must be met to assure proper functions. Our goal as a licensed plumbing contractor, master plumber, and ASSE 5110 certified backflow tester, is to provide a professional installation that is correct. – We read the instructions! Lets face it, making a purchase on a sump pump that sits in a pit and is forgotten isn’t on anyone’s “wish list”. That being said, having a reliable backup system with remote alarm notification can be a “money well spent” insurance against disastrous basement flooding. A water backup pump may seem like a easier, “less hassle” solution but they also require periodic manual testing. Any battery backup system that we install will have a test button on the diagnostic controller and some models will perform automatic testing. All sump pumps need to be checked occasionally but a battery backup system is the only one that will remind you if you forget. We clean out the sump pit and troubleshoot any plumbing problems! One of our core services at Pipe Wrench is to specialize in all aspects sump pump installation. There are many great brand options out there to choose from but like any unique plumbing fixture, an unfamiliar product can cause inefficiency for installers & headaches for future repair plumbers. We have chosen to stock Zoeller brand sump pumps & accessories on our work truck to be readily available. Zoeller is the most popular plumbers choice and carried by all local plumbing suppliers. Our standard battery is the Large Basement Watchdog model that is a “wet cell” which requires adding distilled water one or twice a year. Pipe Wrench also endorses the “Basement Watchdog” brand and it’s PHCC Pro Series for contractors. We only recommend the better or best pump model with a large battery. The parent company of Basement Watchdog & PHCC Pro Series is named Glentronics. This company began as a battery manufacturer that made batteries for other backup sump pump systems. That company history makes this wet cell battery brand affordable & reliable. A deep cycle “maintenace free” marine battery can also be used but it is important to get one with a large capacity, run time, & warranty. Pipe Wrench is a local plumbing & Mechanical service based in Shelby Charter Township, MI 48316. Our service area extends Westward from Macomb, MI 48042, 48044 and includes Rochester Hills, MI 48306, 48309. We are currently servicing clients in Utica, MI 48315, 48317 and have just added Washington, MI 48094, 48095 for same day local service!